What is Dog Steps with 2 Steps? Help maintain and protect your pet's joint health with the Dog Steps with 2 Steps. Pets that constantly jump off sofas, beds, and other furniture can place unnecessary strain on the joints which could potentially lead to arthritis. Reduce your pet's risk today by ordering these compact and durable pet stairs. These dog steps provide a wide surface area allowing your pet to stop and rest on each step before moving forward, which is especially helpful for senior pets. 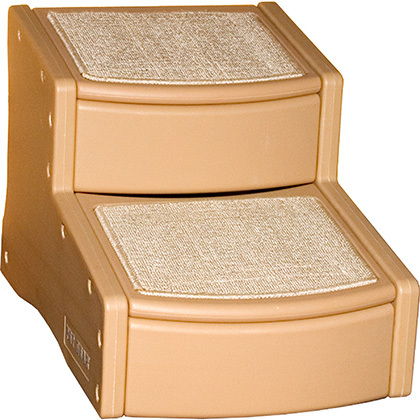 These pet steps support dogs and cats up to 150 lbs and are available in 3 colors (Tan, Sage, and Cocoa) to accommodate most decor. Some dogs may need training. Sturdy yet lightweight and supports pets up to 150 lbs. Wide steps allow for most pets to place all four legs on each step. Rubber grips eliminate slipping on hard surface flooring. Removable and machine-washable carpeted mats make cleaning easy. Your choice of colors (Tan, Sage, and Cocoa) helps to match most interior decor. Assembles in minutes with no tools needed. Place the Dog Steps against the piece of furniture you want your dog or cat to climb up onto and down from with ease. Senior pets that need help getting onto furniture. Read more about how dog steps can help dogs and cats with arthritis. Pets that already experience joint pain or weakness. All other pets to act as a preventive measure against arthritis by reducing the stress on joints when jumping down. Do not use as a step stool. For indoor use only. Place all parts onto the floor, pairing the left and right panels and stair parts. Place the right panel on the floor with the Pet Gear logo facing the floor. Insert the top stair panel with the rug facing upward. The straight edge of the panel should be facing toward the back of the stair unit. Insert the front cover of the top step into the right panel. Insert the bottom step into the right panel. Attach another step covering (for the bottom step). Insert the rod into the right panel. Before attaching the left panel of the staircase, make sure there are no gaps between parts. Align all the holes on the left panel with the pegs from the right sides of the stairs. Push left panel down to secure the steps. If you experience difficulty inserting the parts try adding a little dish soap on the end of the peg before inserting. Measure the height of the location to which you are to trying to give your pet access. Allow for a few extra inches below the top of the surface you are trying to give your pet access to by purchasing steps that are slightly smaller (in height) than the piece of furniture. Select a color that best matches or complements your decor.